Car Stereo City located at 8252 Clairemont Mesa Blvd, San Diego, CA is an inspection and GPS installation center for Fast Money Loan where your vehicle can be inspected. 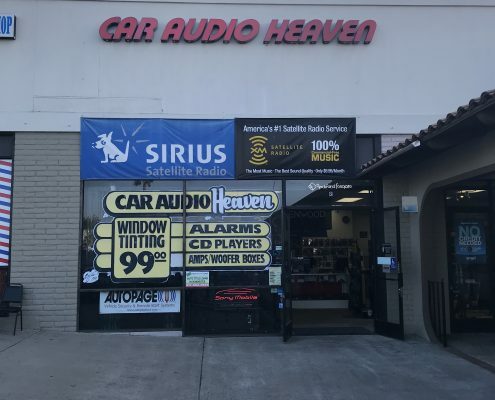 This location provides complete audio care such as music system installation, window tinting alarm system installation and sales. This is a one-stop center for all your car audio needs. This location is not a licensed branch and is a vehicle inspection and GPS installation location, only. San Diego is located about 100 miles south of Los Angeles. It is located adjacent to the border with Mexico. San Diego has a world class deep water port and the city benefits economically from the U.S. Navy as well as from international trade and manufacturing that depends on the port. The major contributor is Tourism. People come here every year to enjoy the beaches, numerous parks and mild climate throughout the year. The University of California San Diego and the adjoining UCSD Medical Center have combined to make the area a major international powerhouse for biotechnology. Need cash for a rainy day? Car title loans are a simple way of leveraging the residual value in a vehicle that you own and is used to secure an instant cash loan. If your car has enough value according to the Mannheim method and you meet our credit criteria, you might be able to get cash for your car title. The loan can then be paid off in easy set installments on a set date. To apply, please complete the questionnaire on this site and find out if you might be eligible for a title loan from Fast Money Loan. Here’s how it works, irrespective of whether your credit is good or bad makes no difference to us at Fast Money Loan. Our loans officers will professionally evaluate your vehicle to ascertain its current value. If the value is high enough to secure a loan, we will then determine if you have the ability to pay back a loan. Once you meet these conditions and our credit specifications, we will contact you to set up a meeting. Once you are approved for a car title loan, you can continue to keep your car, we only need to put our name on your car title as its lien holder. Once you complete all the loan payment and its completely paid off, we will remove our name from the lien holder of the car. Contact us today for more information on how you can live free from your old unpaid bills!